If you’ve just bought a new, expensive flat screen TV, it could be worth getting it mounted by an experienced professional. The last thing you want is for the wall fixings to fail and your TV falling. An Aspect handyman will take care of every detail for you. It’s not just about fixing a bracket to a wall. Knowledge is needed when choosing the right fixings for the wall fabric, or for chasing a wall to hide electrical cables. Call our team today. We can arrange for a handyman to visit and take care of everything. We’re fully trade accredited. Aspect is a member of The Guild of Master Craftsmen and the Painting and Decorating Association (PDA). 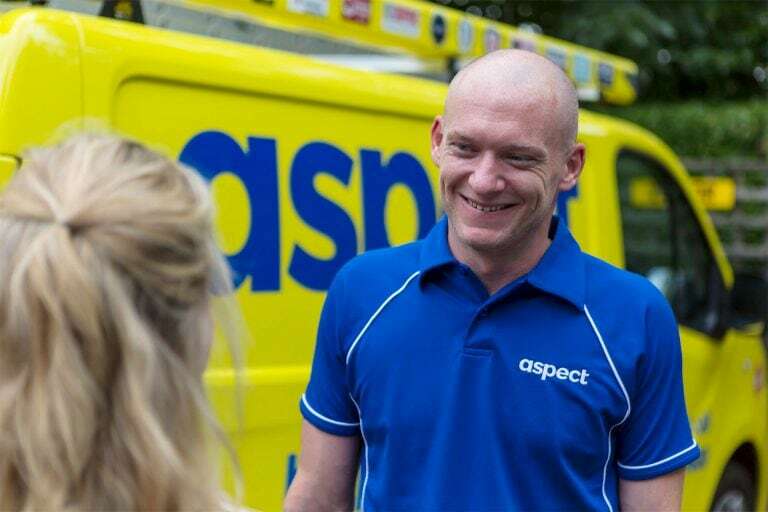 In addition, the Aspect Guarantee covers our tradesmen’s workmanship for 12-months. 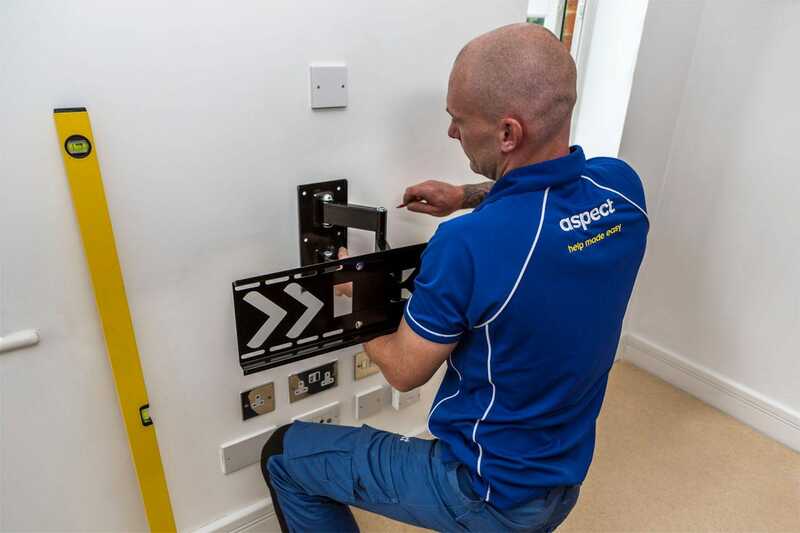 When you book an Aspect handyman you can count on getting the professional expertise you’re looking for. If your TV is being mounted on a wall made from plasterboard, you need to be sure of the fixings being used. We don’t recommend using standard fixings to attach your TV bracket to the wall. The weight of the TV and the bracket might be too much. It’s not worth the risk of having a broken TV. Specialist fixings are available that are better at holding heavy items on plasterboard. Calculate the combined weight of the TV and bracket. You should allow for additional load too, especially if the TV is being mounted where people (including children!) might pull on it. The pull load of the board shouldn’t be an issue. If you’d rather not take any chances mounting your TV on a drywall, the safest option is to reinforce the wall. Our handyman can do this by cutting a section of plasterboard large enough to attach a piece of timber (noggin) that bridges across two studs (vertical timbers). This provides a solid base that can be screwed into. Our handyman will fit a new piece of plasterboard over the hole created and finish the job with plaster ready for decorating. This process takes a little longer but also allows cables to be hidden for a much tidier finish to the job. Nobody like seeing metres of cabling attached to their wall-mounted TV and audio. Using metal conduit or plastic trunking to enclose cables is preferable. Our handyman can cut and fit them when mounting your TV. We think the best way of managing unsightly cables though is to completely hide them from view. TV and audio cables can easily be run behind plasterboard walls. For solid brick or concrete walls a chase can be cut. Metal trunking or conduit must be used for wires carrying a live current. It’s also better to use these if new cables ever need to be run. Once everything is in place the chase can be covered with a skim of plaster before painting. An Aspect handyman will take the following steps whenever they’re wall-mounting your TV and audio.